I am not a Hakka but I do have my fair share of abacus seeds as my wife is a Hakka and two of my sister in laws are Hakka. 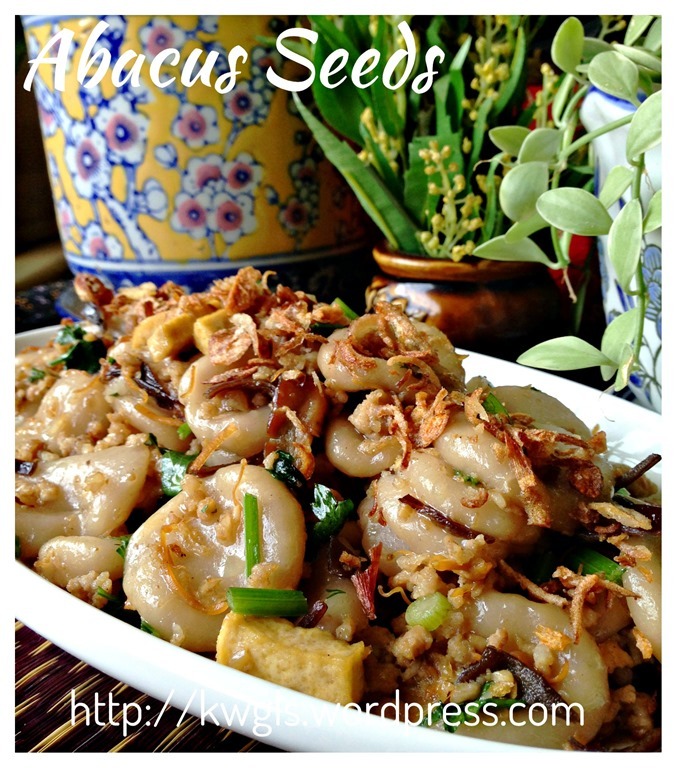 Obviously, this is an auspicious dish for the Tai pu (大浦） Hakka clan usually served during happy occasions such as weddings and Chinese New Year reunion dinner. 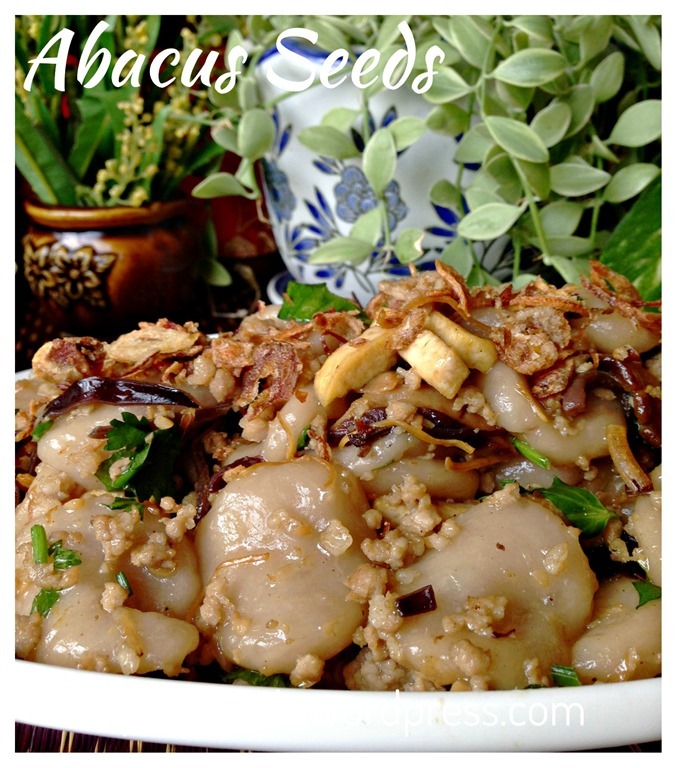 Abacus seeds are made from yam paste and some type of starches – can be tapioca or wheat starch. 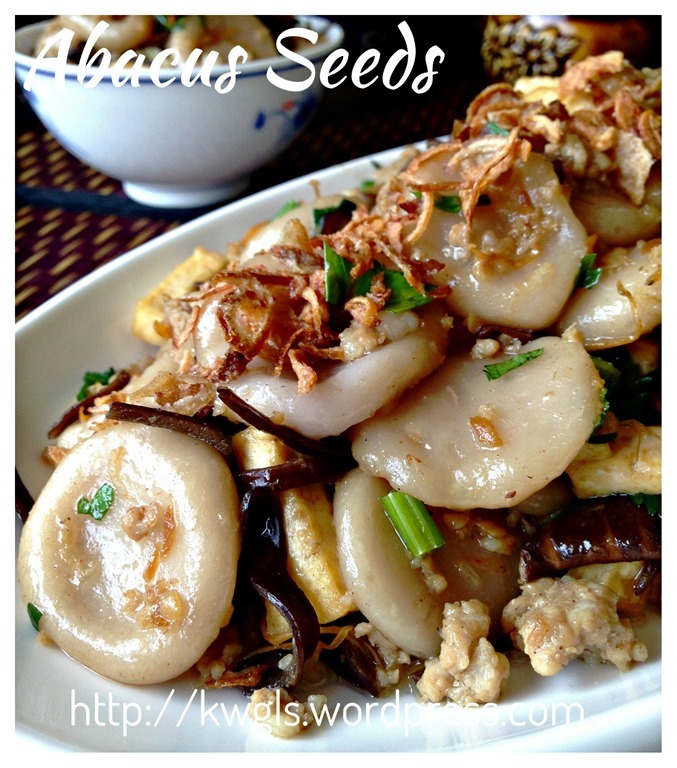 It is a savoury dish that can be served as a main meal or as a snack. I have decided to prepare this for dinner tonight. 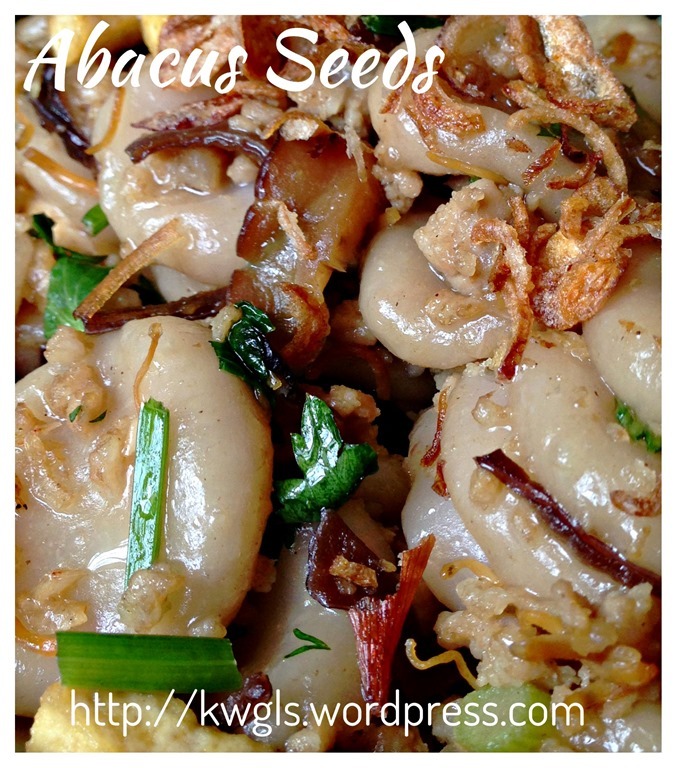 It was called abacus seeds because it looked like the seeds in an abacus. 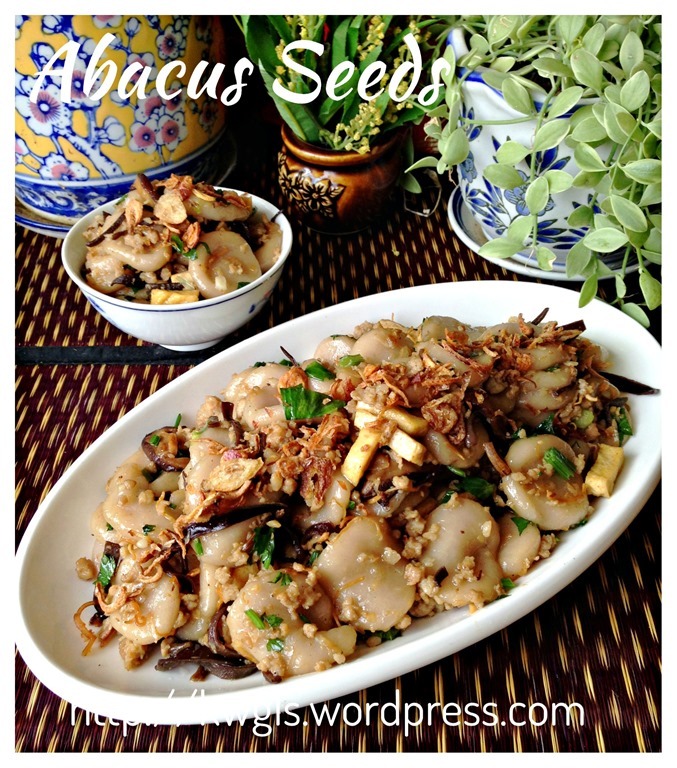 Today, the abacus seeds that I prepared are rather flat for the sake of my children and I do not like the type that are too round since it can be rather chewy and more difficulty to cook. Some used a chopstick to make the cavity in the yam ball but I have decided to use a finger to make the cavity and that saves lot of time… For shaping, I will leave it to readers to decide whether you like the round ball with small cavity or a rather flat shallow cavity like what you saw in this illustration. 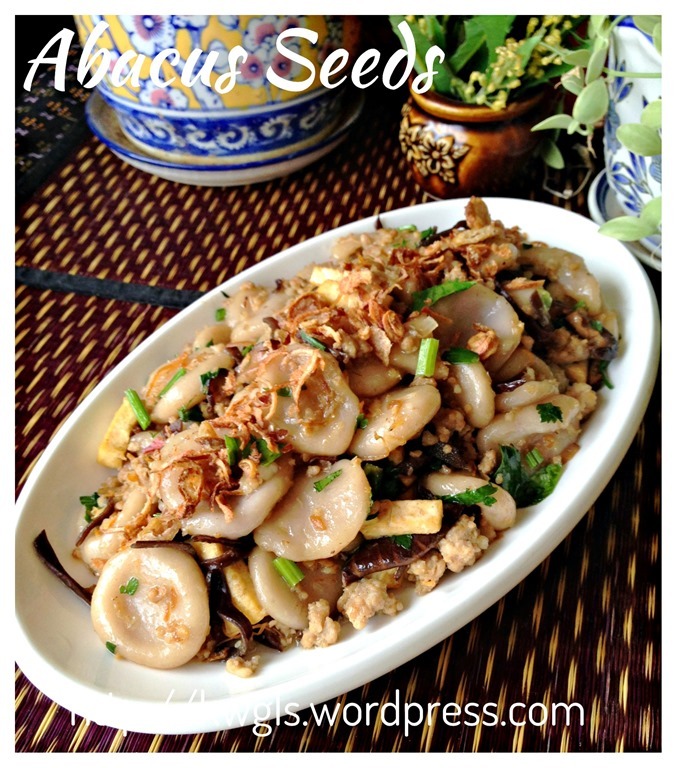 I am very pleased with the recipe that I used for the abacus seeds. 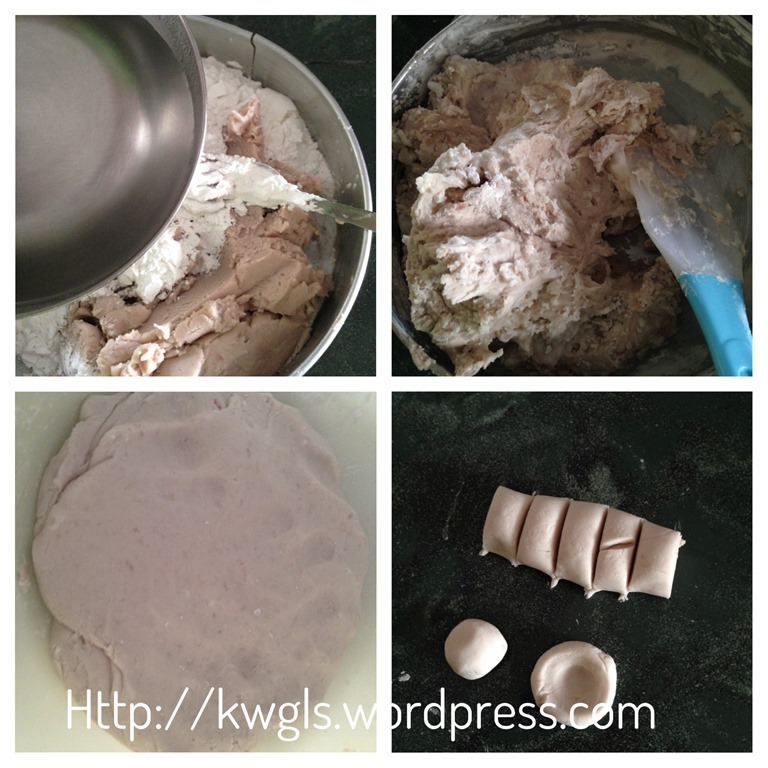 The dough is very easy to handle and I can shape it rather fast about 1/2 hour for 500 grams of yam.. The outcome is strong yam fragrance, soft abacus seeds and that definitely is more suitable for kids since it is easier to chew and digest. 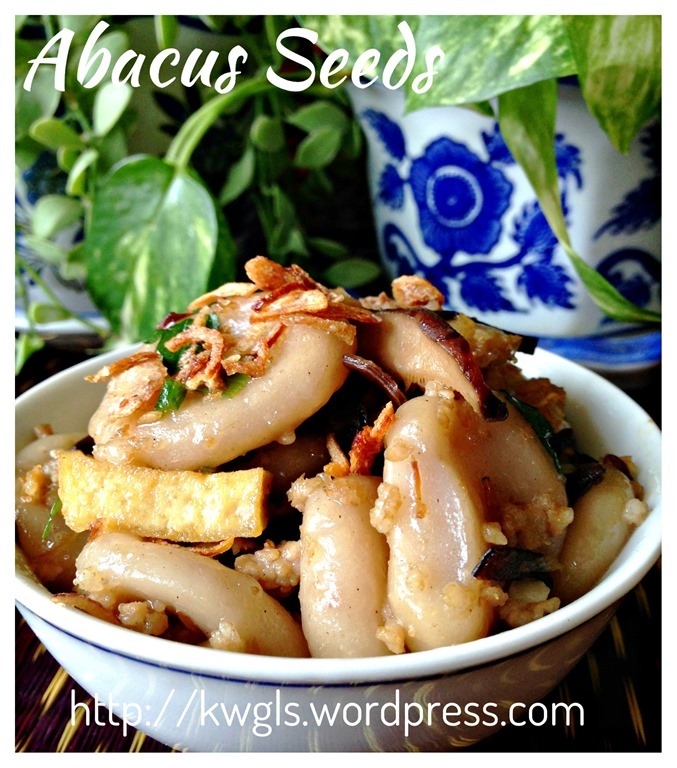 If you like more chewy abacus seeds, you will have to add more tapioca flour. Steam the yam until soft. Use a fork to lightly scratch the yam and if it can be easily scratch, the yam is cooked. 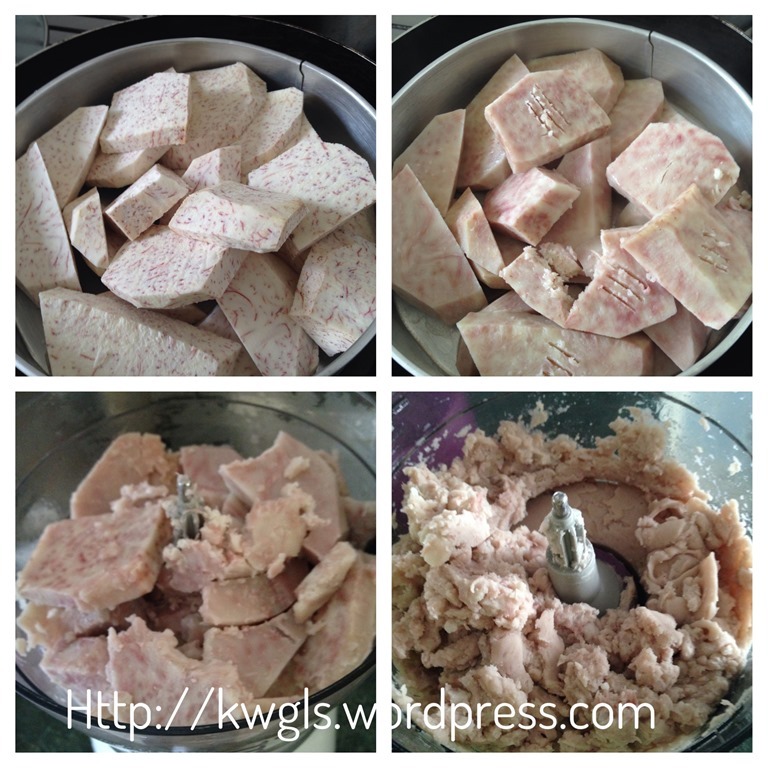 Transfer the cooked yam to a food processor, blend until as fine as possible. If you do not have a food processor, use a fork to mash the yam until fine. 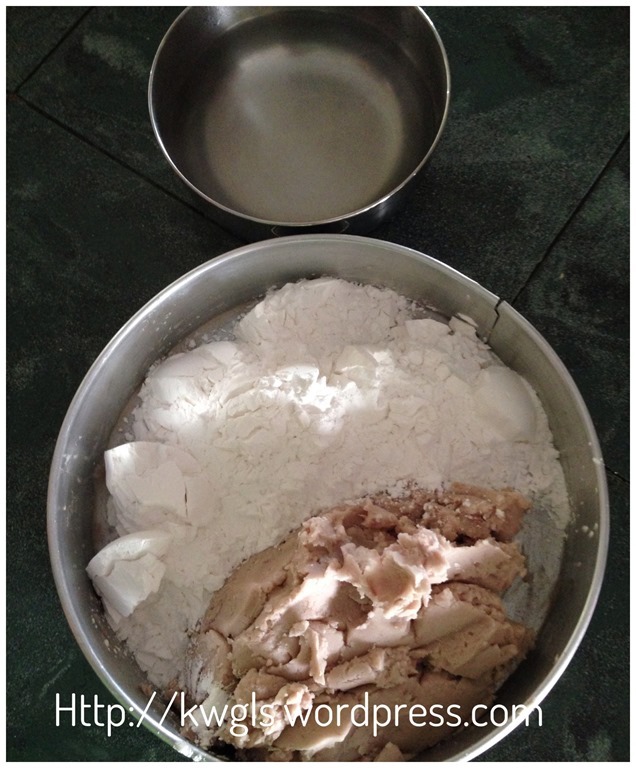 In a bowl, mix the mashed yam and tapioca flour, gradually add in hot water. Use a spatula or spoon to stir until crumbs are formed. When your hand is able to handle the warm dough, knead the dough until it become a pliable dough, smooth and do not stick to your hands. The water should be gradually added as some yam is drier and some can be very wet. You may or may not need to use all the water. 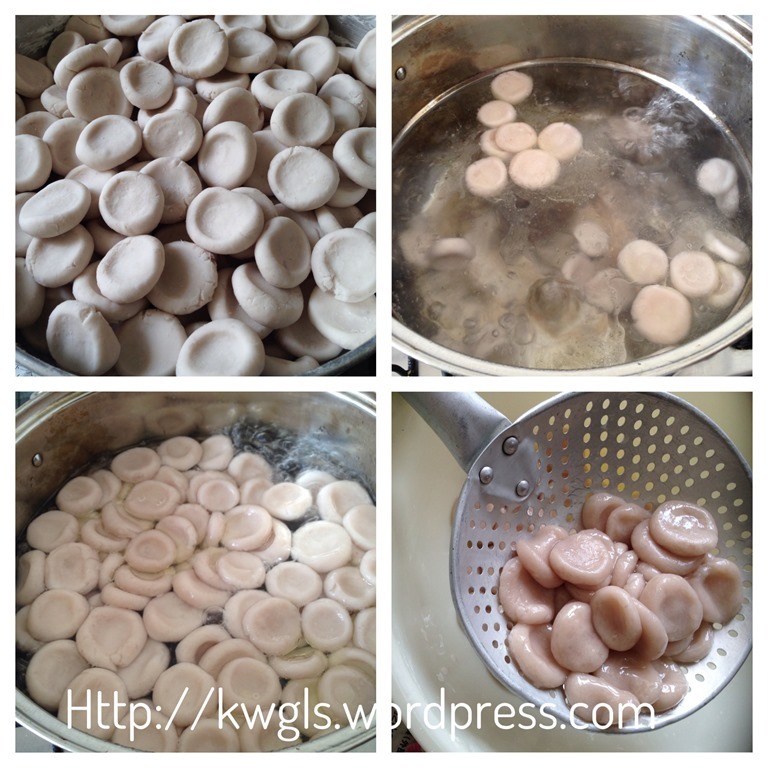 If it become too wet, add tapioca flour tablespoon by tablespoon. If too dry, add water teaspoon by teaspoon. Take some dough, shape long and cut into sizes of about 5 grams each (or your desired size). Take one portion, shape round and use the finger to press onto the centre such that a cavity is formed. If your prefer smaller cavity, you can use the chopstick to make the cavity. 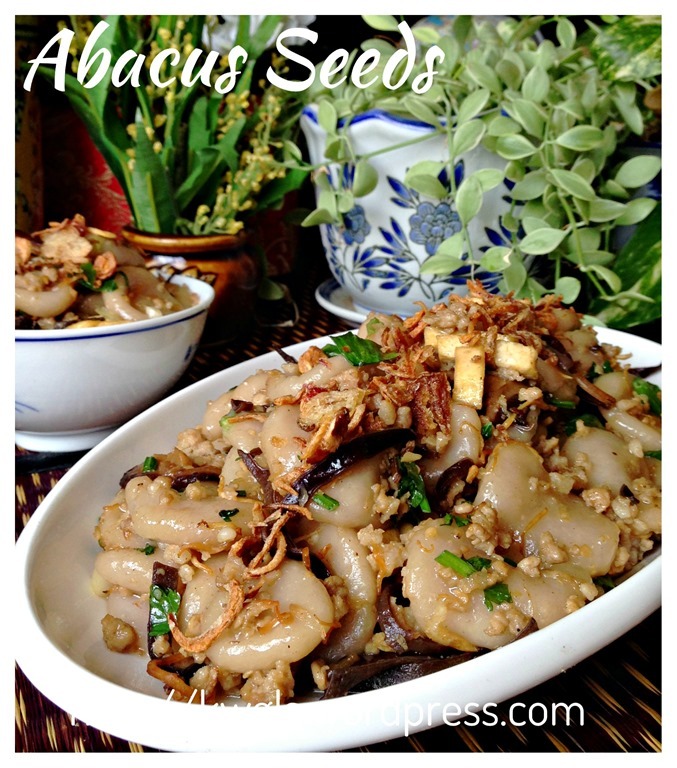 In a pot with hot boiling water and 1-2 tablespoons of cooking oil, put the abacus seeds. It will drop to the bottom and once it floats to the surface of the water, the abacus seeds are cooked. 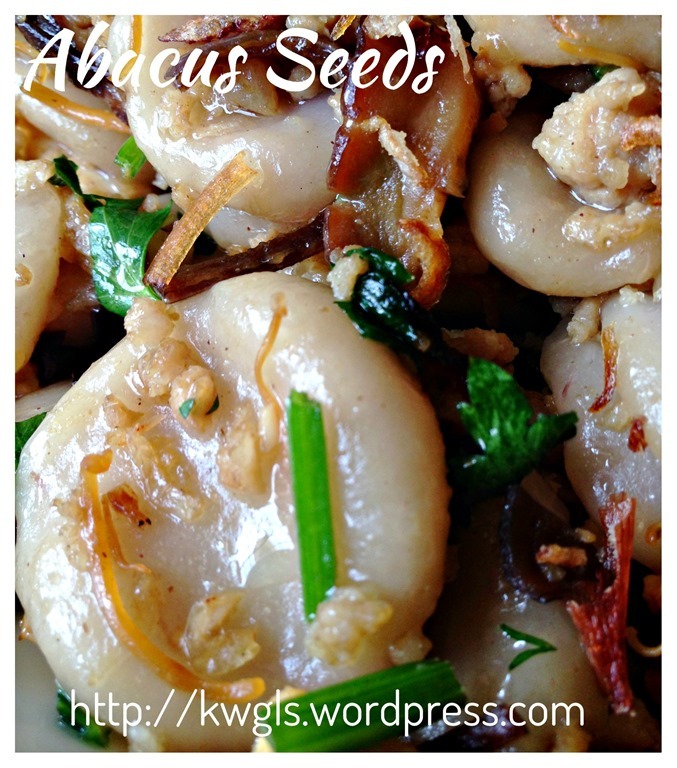 Drained and drizzled with additional cooking oil on the abacus seeds to avoid the seeds sticking to each other. In a frying pan, put 3 tablespoons of cooking oil, sauté the minced garlics and mushrooms until garlics are golden brown. Add the sliced dried squids and dry shrimps, stir fry for one minute. 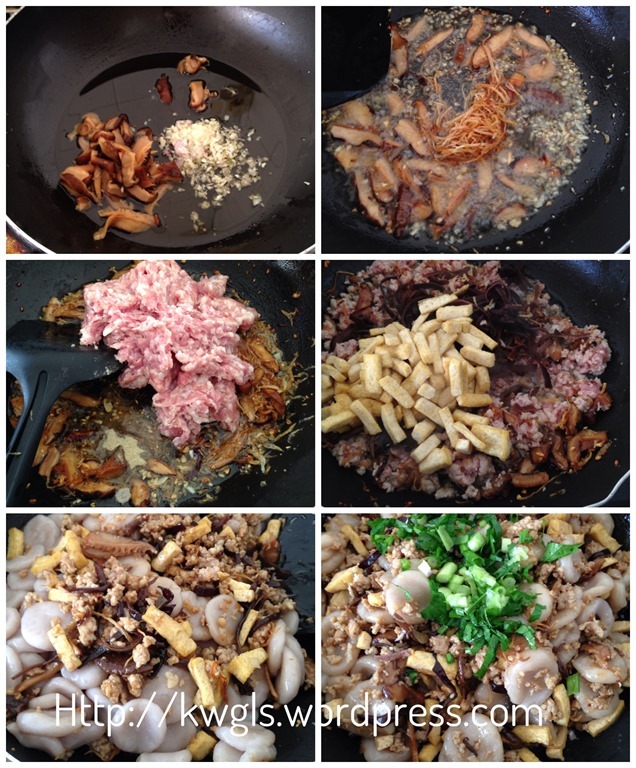 Add the minced meat and stir fry until the meat are about 70% cooked, add the firm bean curd and black fungus, stir fry until well mixed. 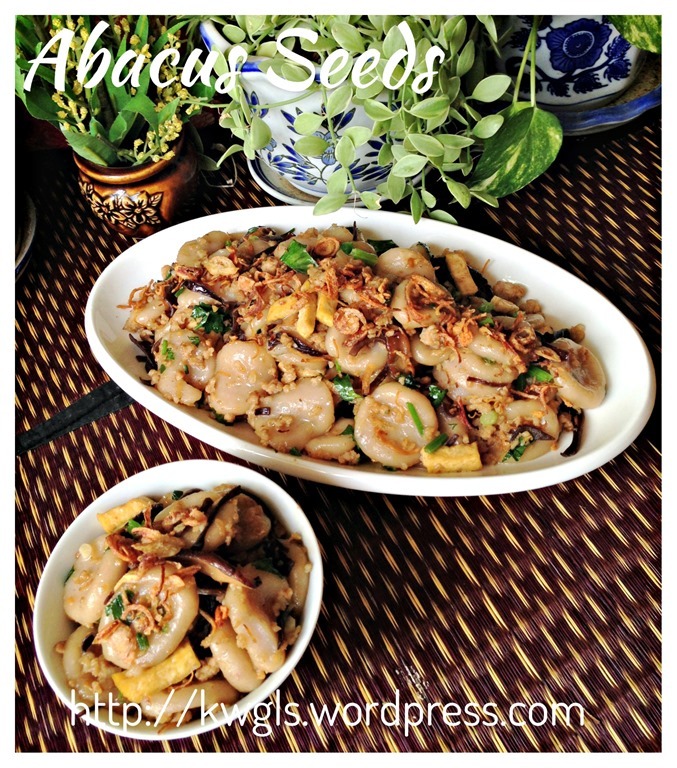 Add the abacus seeds, stir fry for 2-3 minutes and followed by chopped Chinese celery and spring onion. Finally add Chinese cooking wine and seasoning to taste (suggested: light soya sauce, salt, oyster sauce and white pepper). Dish up and garnish with additional deep fried shallots. Can be served as a snack or a main meal. As mentioned earlier, I am pleased with this recipe and possibly you want to give it a try also. Do not discount this recipe based on the shape of which I have my reasons because of my kids. Do shape it into your preferred shape and taste will not be compromised..
(updated as at 15 October 2014) here and you can follow me at PINTEREST or visit the blog’s FACEBOOK PAGE to keep abreast of my future posts. 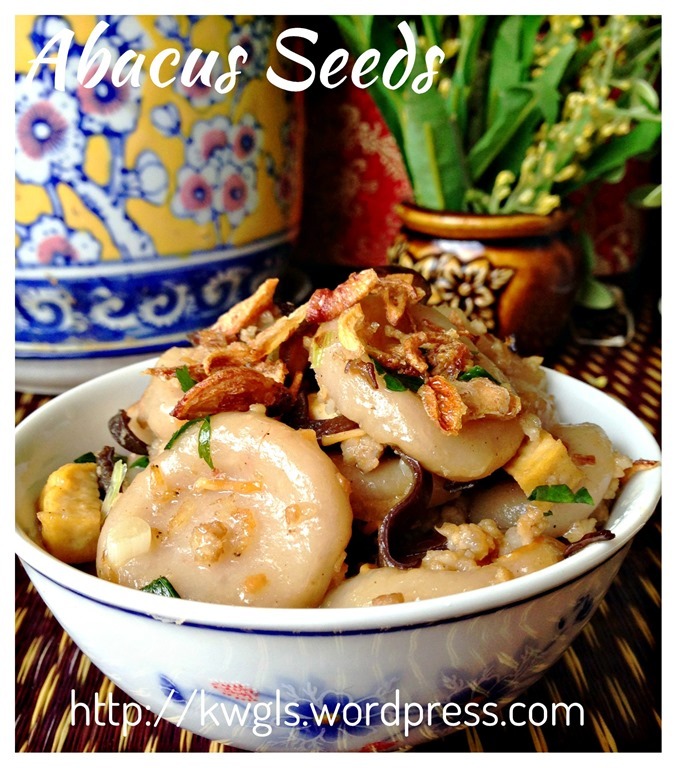 This entry was posted in Chinese and Asian Cakes and Snacks, Food Preparation Series, Noodles, Rice and Others and tagged 8, abacus beads, GUAI SHU SHU, Guaishushu, kenneth goh, postaday, 客家算盘子，Hakka abacus seeds. Bookmark the permalink. Hi. Kenneth, can I prepare this dish one day in advance? 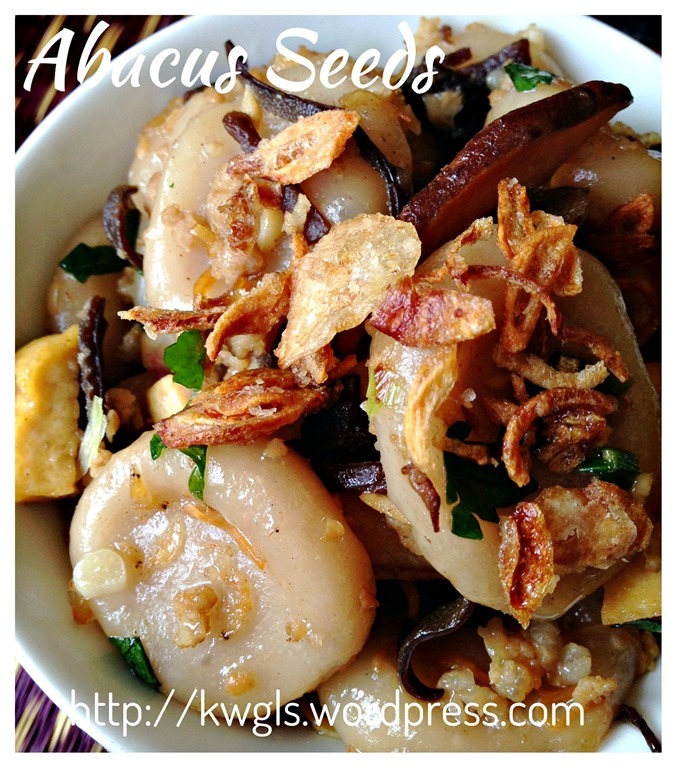 Like boil the abacus yam then chill it in fridge for frying with everything? Will the taste and texture be compromised significantly? Sorry for the late reply as it was hidden in somewhere. 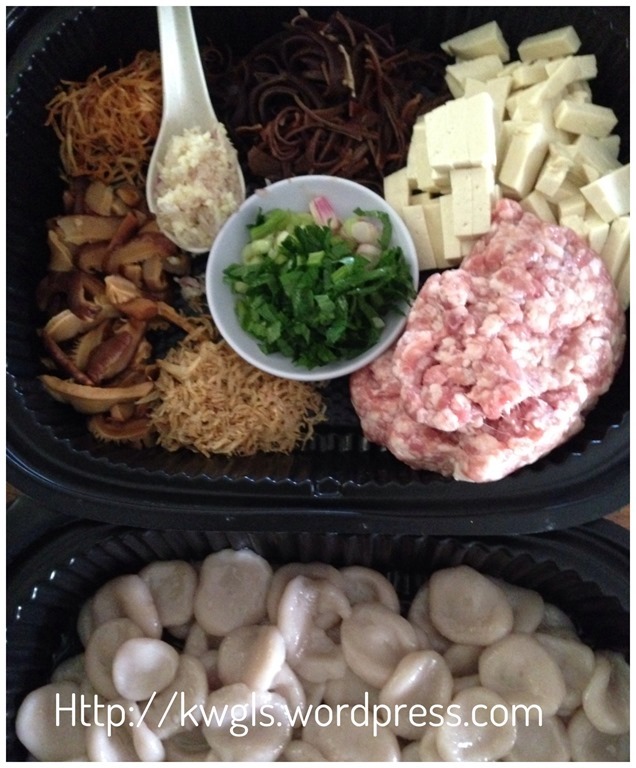 Yes, you can always prepare, deep freeze and cook on the day you wished.